German physician; born at Mayence Feb. 12, 1843. He studied at the universities of Würzburg and Giessen, receiving from the latter his degree as doctor of medicine in 1866. Accompanying in the same year a patient to Madeira, he established himself there as a physician, and soon became one of the leading practitioners. In Funchal, the capital of the island, he founded and endowed an international hospital for sailors. In 1896 he removed to Paris, where he is now (1903) practising. 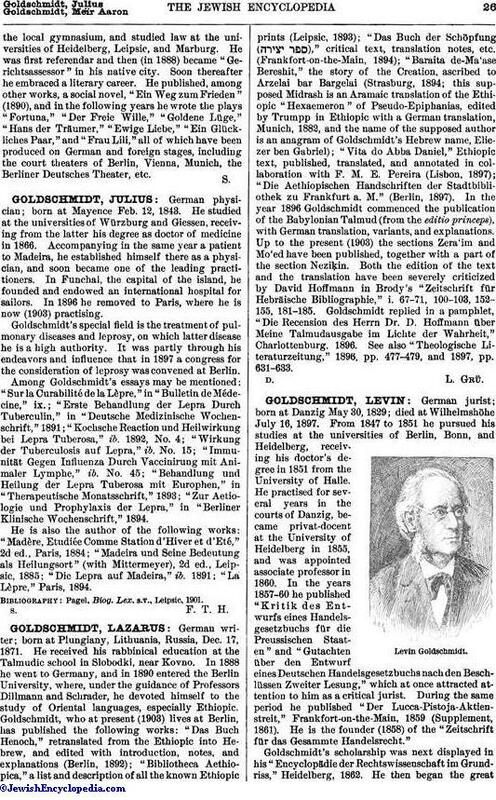 Goldschmidt's special field is the treatment of pulmonary diseases and leprosy, on which latter disease he is a high authority. It was partly through his endeavors and influence that in 1897 a congress for the consideration of leprosy was convened at Berlin. Among Goldschmidt's essays may be mentioned: "Sur la Curabilité de la Lèpre," in "Bulletin de Médecine," ix. ; "Erste Behandlung der Lepra Durch Tuberculin," in "Deutsche Medizinische Wochenschrift," 1891; "Kochsche Reaction und Heilwirkung bei Lepra Tuberosa," ib. 1892, No. 4; "Wirkung der Tuberculosis auf Lepra," ib. No. 15; "Immunität Gegen Influenza Durch Vaccinirung mit Animaler Lymphe," ib. No. 45; "Behandlung und Heilung der Lepra Tuberosa mit Europhen," in "Therapeutische Monatsschrift," 1893; "Zur Aetiologie und Prophylaxis der Lepra," in "Berliner Klinische Wochenschrift," 1894. He is also the author of the following works: "Madère, Etudiée Comme Station d'Hiver et d'Eté," 2d ed., Paris, 1884; "Madeira und Seine Bedeutung als Heilungsort" (with Mittermeyer), 2d ed., Leipsic, 1885; "Die Lepra auf Madeira," ib. 1891; "La Lèpre," Paris, 1894. Pagel, Biog. Lex. s.v., Leipsic, 1901.